Replacement plastic battery case that holds the 2 x 6 volt batteries which often power the 12 volt submersible water pump on trailer tent kitchens. Replacement small rubber grommet which fits in the holes for the stove top wire rack and draining board rack on Camp-let trailer tent kitchens. Complete replacement cold water tap for most Camp-let trailer tents upto 2010. Includes microswitch, hose connection, wiring and bulkhead fitting. Complete replacement chrome effect cold water tap for most Camp-let trailer tents from 2011 onward. Pre-wired tap includes internal microswitch, fitting for 10mm water hose and washer and plastic mounting nut. Lever type tap has folding stem to allow the kitchen to close. Replacement handled water bowl to fit Camp-let trailer tent kitchens from 2010 onwards. This is the rectangular bowl which fits in the slide out sink bracket on the right of the kitchen on most Camp-let models. Replacement rectangular plastic kitchen bowl to fit Camp-let trailer tents prior to 2010. This compact water carrier is the type supplied with Camp-let trailer tents and fits in most trailer tent kitchens. Low profile design will also fit in most front storage boxes, roof boxes and will fit easily in the car boot. Replacement batteries for the 12 volt water pump on Camp-let and other trailer tents. Batteries are located in a plastic case in the kitchen of Camp-let and Trigano trailer tents. Folding steel prop for the kitchen lid on Sunncamp, Cabanon and Conway trailer tents. Available for left and right hand side. 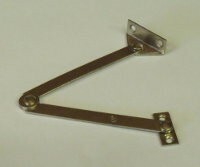 Lever clamp to hold the kitchen unit to the main trailer tent body used on Sunncamp, Cabanon and Conway trailer tents.